The sedum genus is a large one, including just under 300 species. It is part of the same Crassulaceae family as the familiar jade tree, with similar fleshy leaves. Sometimes also known as "stonecrop", sedums are among the most valuable garden plants. Cultivated varieties are generally drought tolerant and vigorous, with flowers that are attractive to butterflies and pollinating insects. Recently plant taxonomists moved tall (18 inches or more) ornamental sedums, including the popular Sedum spectabile and its hybrids, into the genus Hylotelephium. However, many horticulturalists and merchandisers still refer to these plants as sedums. 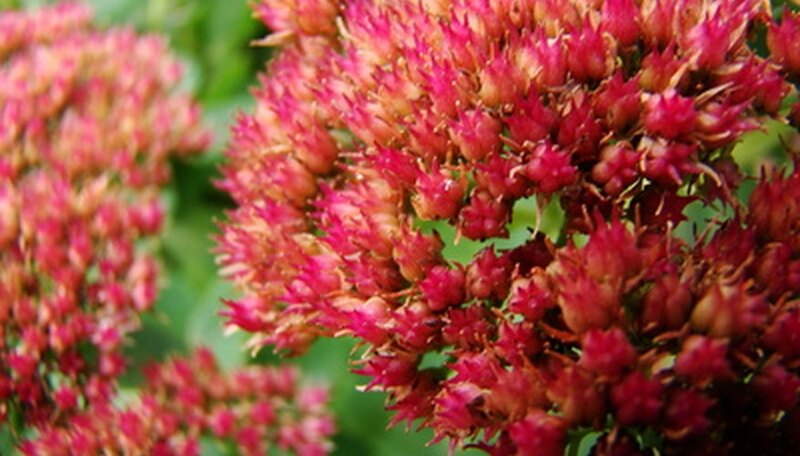 The most popular tall sedum on the market is "Autumn Joy", hybrid that resulted from the 1955 crossing of two species, Sedum spectabile and Sedum telephium. It grows to be about 24 inches tall, with large broccoli-like flowerheads that develop during the summer. The star-shaped flowers are pale green at first, then ripen to rosy pink in the early fall. They age to darker red and finally brown. Even the brown flowerheads provide winter interest if left on the plants at the end of the growing season. A related hybrid, "Autumn Fire", has the same form, but richer fall color. Among the green-leafed, showy sedums are '"Neon", with electric pink flowers and "Stardust", which has very large, white flowers. "Brilliant"; "Carmen"; "Stardust" and "Steven Ward" all have similar form, with flower colors ranging from palest pink ("Stardust") to nearly red ("Carmen"). For lovers of variegated leaves, there is "Variegatum", featuring leaves edged in creamy white and pink flowers.